Gemstones are colored because certain wavelengths of the visible spectrum of electromagnetic radiation get absorbed while other wavelengths are transmitted. Which wavelengths are absorbed depends on the physical and chemical properties of the gemstone. We will spare you the technicalities here and suffice to say that the color of gemstones can be altered by heat treatment. This is because the heat can change things in the makeup of the material which on its turn causes absorption or transmission of wavelengths that weren’t absorbed or transmitted before. But changing a gem’s color isn’t the only effect heat treatment can have on a gemstone. It is also used to enhance the clarity of a gem. When stones aren’t totally transparent, heat may be able to dissolve the impurities which cause the lack of transparency. Another case where heat treatment is used is after irradiation treatment, where it serves the purpose of stabilizing and/or altering the initial color obtained by subjecting the stone to high energy radiation. Heat treatment of gemstones has been around since the invention of the written word. Ancient historical sources like Pliny mention the use of it and ancient jewelry containing heat-treated gemstones have been found. Writings throughout history further confirm the use of heat to enhance the appearance of gemstones. Examples of gemstones which were heated in our early history are carnelian (improving its color) and ruby (improving color and clarity). Let’s look at the history of heat treatment for specific gemstones. The correcting of the external appearance of ready-made products and works of art made of amber through heating dates back to ancient times. The method is inspired by natural phenomena. The amber which basked on the beaches and dunes became clear and obtained an increasingly intense hue.Amber nuggets were thermally clarified and tinted in the Roman production centre in Aquilea, and in the millennia that followed in the workshops of the amber artists from the towns by the Baltic Sea, still unrivalled in their artistic ingenuity and master craftsmanship. Each master had his own recipe for improving nature in the desired direction. It was only in the 2nd half of the 20th century that a tool appeared, which was as effective as it was risky. This tool is the pressure furnace filled with inert gas: nitrogen or argon. In the air-tight chamber of the furnace it is possible to quickly change the amber’s bubbly structure into a material which is clear but unfortunately has lost its natural golden colour. We get a cold watery tint which is far removed from tradition and customers’ expectations. When heated amber is cooled quickly small fractures develop. These small fractures are called sun spangles and can be quite desirable in appearance. Another possible purpose of heat treatment on amber is to make it resemble aged amber. Antique amber is often a bit darker due to prolonged oxidation of its surface. When unoxidized material is heated in an iron pot filled with sand for extended periods of time, it will assume the aged look. Small bits of gem grade amber can be heated and then pressed to create ambroid, also known as pressed amber. This technique was invented in the 1870’s by a German company named Stantien & Becker from Königsberg and industrialized in the 1880’s in Vienna, Austria. Aquamarines are commonly heated these days in order to get rid of the yellow component, making the stone a more pure blue. The temperature involved in this process is quite low (~450°C) and although there aren’t any records of this, the treatment could have been easily performed in early history. Rubies and sapphires have been heat treated for thousands of years. 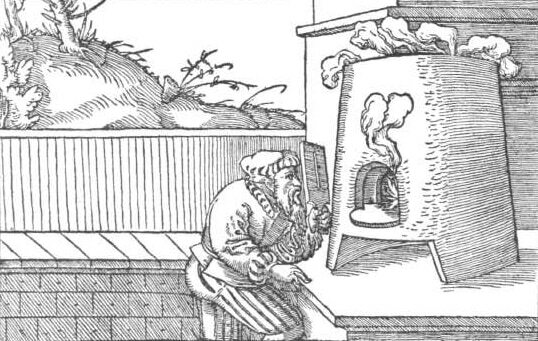 Stones were packed in clay or ground stone pastes and placed in a fire which was then brought to higher temperatures by increasing the flow of oxygen with the aid of blowpipes or bellows. The temperatures which can be achieved with a wood fire and a blowpipe or bellows are relatively low compared to the temperatures modern furnaces can reach. This early moderate heat treatment doesn’t differ much from the temperatures corundum crystals are subjected to in the earth’s crust, making the distinction between treated and untreated stones more difficult. Corundum is often color zoned which can muddy the look of the stone somewhat. Let’s take a ruby with a blue core for example. Moderate heat treatment can cause the blue part to disappear, improving the overall appearance of the stone. Other effects of heating corundum with moderate temperatures can be clarity improvement. Very fine rutile needles can, when they are present in great numbers, obstruct light, causing the gem to lose brilliance and appear dark. Heating such a stone may cause the rutile to dissolve into the sapphire, clearing it up considerably. Halo (Stress Fracture) in a Sapphire Indicating Possible Heat Treatment. In the 1960’s Thai burners found out that ‘worthless’ gueda sapphires could be turned into valuable, bright blue stones. This lead to a run on the cheap material and an enormous output of blue sapphire. By 1981 burners discovered that yellow to orange stones could be obtained by (re-)treating gueda sapphires that didn’t turn blue with the original recipe by making a few changes to it. A second run on the material that was left occurred and an increased supply of yellow and orange stones hit the world market. The temperatures involved in gueda heating are high, 1600 degrees celsius and up for the most part. 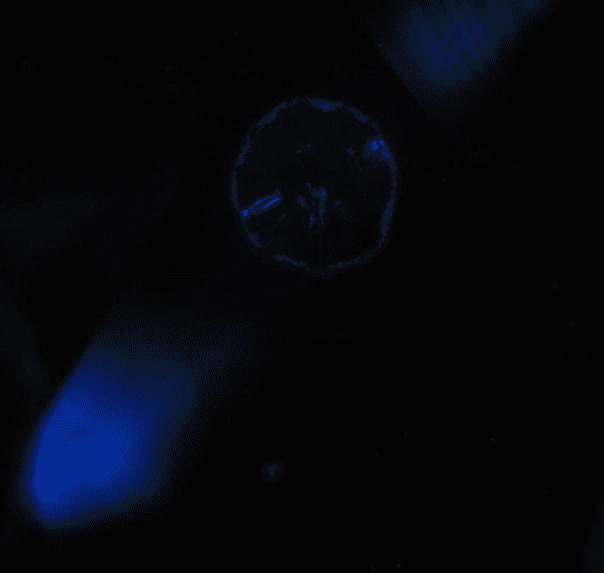 The high temperatures will cause solid inclusions to expand at a different rate than the host with stress fractures, called halos, as a result. Heat treatment of diamonds commonly occurs after irradiation treatment. This happens to stabilize and alter the color obtained by the high energy bombardment. The term used for this treatment is named annealing. For more information about this we refer you to our irradiation article. In 1969 Russian researchers reported that heating diamonds which were subjected to high pressures could alter their color. This High Pressure, High-Temperature treatment, abbreviated to HPHT deserves its own section in this wiki. Jade can be heated in order to darken light colored material or vice versa: to lighten dark material. The conditions and history of these techniques are very poorly described in gemological literature and covered in secrecy. Antique jade has often undergone a fair bit of oxidation of its surface giving it its aged look. Intense heat can mimic this and is applied to make jade replicas look old. Acids or alkalies are used for this purpose too. The Quartz family is another member of the group of heat treated gem materials. Natural Amethyst and Heat Treated Amethyst-Gone-Citrine. Brownish or grayish Zoisite can be heated to become blue-purple zoisite, better known as Tanzanite. The blue variety was first found in Tanzania in 1967 and shortly thereafter it was discovered that the unattractive brown and gray varieties heated to blue. Although the Greeks already recorded yellow topaz to go colorless when heated it may be that they were mistaking citrine for topaz. Yellow quartz behaves the same way and figuring out what the Greeks meant exactly with their ‘topaz’ is difficult. More certain is the invention of heating reddish-brown Brazilian material to pink or red. 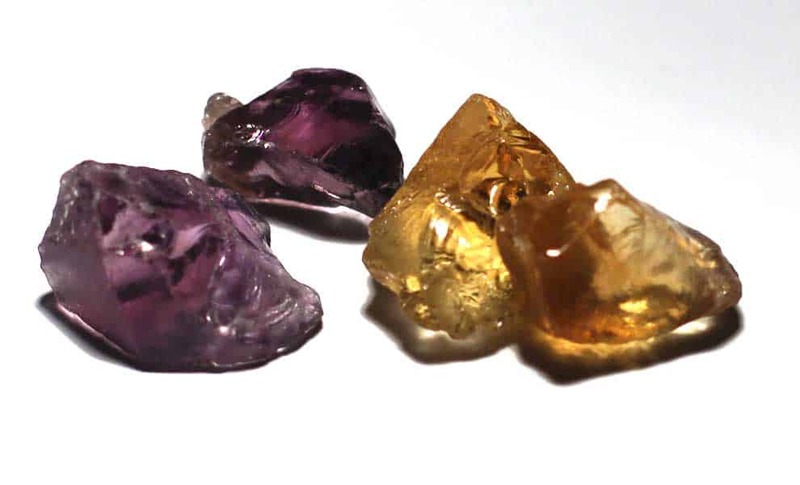 Robert Webster mentions that the process may have been discovered by a Parisian jeweler named Dumelle who heated Ouro Preto brownish topaz, packed in sand, to pink by heating it slowly to 500°C and letting it cool gradually. It was Dumelle who reported his findings to the Academy of Sciences, where the process was recorded. Irradiated blue topaz is typically annealed in order to stabilize the color. Blue topaz, especially deeply saturated material, is almost always a product of irradiation and annealing. Deep blue stones are extremely rare in nature. Dark colored tourmalines are commonly heated these days in order to lighten their color. Dark unattractive green stones can turn a bright emerald green or canary yellow, deep brownish red can heat to pink and purple stones can be heated to a popular light blue. It is expected that the heat treatment of tourmaline on a large scale is a recent development. The color of zircons is easily changed by low temperatures. Beer bottle-brown stones can be turned colorless over a candle flame and some brown stones can be heated to a bright blue. This last treatment requires higher temperatures (900-1000°C) and a reducing atmosphere (no influx of oxygen). When the stones are heated in an oxidizing atmosphere (an influx of oxygen) they may turn a golden yellow. Zircons often contain the radioactive element uranium which causes the crystal structure of zircons to degrade over time. Heat treatment will cause the degenerated crystal structure to be restored which has a few side effects. You can read more about this on the zircon page.